Red Bus Bingo came to life in 2010 as part of the 888 network and took the online bingo world by storm. With a fresh faced site, free bingo and interested ways to win, it was an instant hit and players flocked to come along for a ride. The huge volumes of people have since faded away but the charm still remains. With less people in the main rooms, there’s now a higher chance than ever of winning. Red Bus Bingo offers 3 main new player offers, ranging from free bingo to deposit bonuses and free spins. Our first offer is the go to 888 network offer and lets you play and win up to £300 everyday in your first 3 days of membership. Red Bus Bingo: Free Ride Tab – Tour the Town with Your Free Bingo Pass! Simply click the image to be taken on your free ride to Red Bus Bingo where you’ll be automatically gifted 3 days free play. The 75 ball bingo room is open from 07:00 – 22:00 with a jackpot every hour with bonuses of £5, £2 and £1 available. Don’t miss the bus though – you only get three days! 2. Deposit £10 play with £35! Our second offer is one for us that like a little bit of something for nothing. 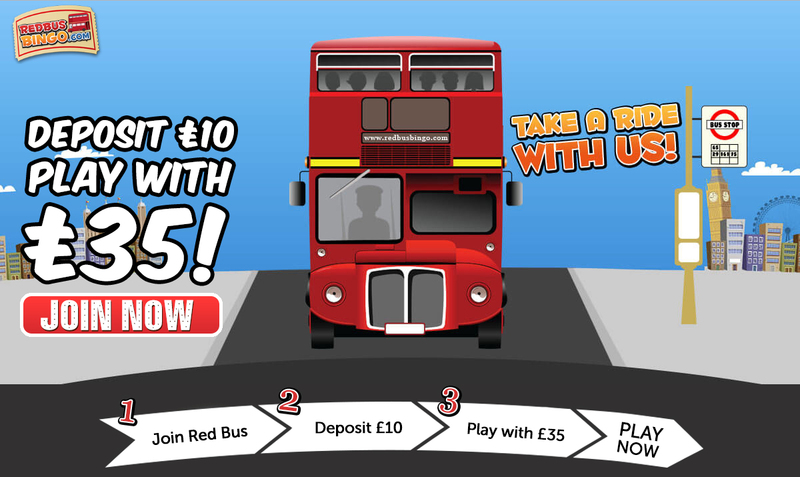 Take a ride with Red Bus Bingo and you’ll be playing with £35 when you deposit £10. Red Bus Bingo: Deposit £10 Play With £35! Hit the image above to head over the Red Bus Bingo and you’ll be well on your way to a £25 bonus. Absolutely free. Claim your 250% bingo bonus now and hit the balls with a couple of extra quid. That does us just fine. Prefer to have a couple of spins with that last offer? No problem. Hit the image below and use the promo code: COACH. 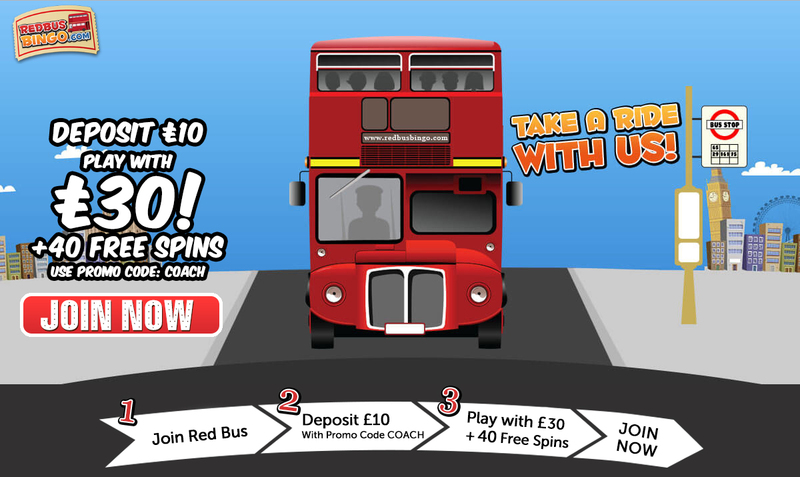 Following the pic and entering the Red Bus Bingo promo code: COACH will get you in with 40 free spins, a 100% games bonus and a 100% bingo bonus when you deposit as little as £10. We’ll be on the first big red bus, thank-you very much. Red Bus Bingo isn’t shy of games either. The site boasts a variety of bingo, casino, instant games as well as scratchcards to give you a little variation with what and how you play. Bingo is taken care of with the usual 90 and 75 ball bingo games to get your regular fix. 5 line bingo, the Swedish originating game, adds another layer to your bingo arsenal where you can win with 1, 2, 3, 4 or 5 lines by making horizontal or diagonal lines. Putting bingo on the back-burner lets us look at slots,casino games and instant games all available to you when you sign up with Red Bus Bingo. Choose between a variety of games from Millionaire Genie and Mystic Mask to the Wheel or Wins and Starburst. That’s a whole lot of winning potential. Red Bus Bingo is available on both mobile and tablet, but only through your chosen browser through the device. Despite being mobile capable, respective Apple and Android apps do not exist as of current. Wagering with Red Bus Bingo is similar to all 888 sites and can be tricky to pick up and you should always read the terms and conditions before signing up. Information written at the time of posting may also have changed, so don’t neglect the small print. You should also note that photo ID, proof of address and a copy of card my be requested at any time. A maximum withdrawal time of 10 working days will be imposed, with wire transfers taking the longest time. The usual guideline is between 4-7 days working days before a withdrawal is seen in the account. A maximum withdrawal number of 10 per day is also imposed with minimum withdrawal amount of £10. A friendly customer support team is always available 24/7 with various options to get in contact so that you’re always kept in the loop. Phone lines are open between 10:00 and 02:00 to make sure that you’re all okay at all times of the day. +44 0203 794 3047 if you are outside the UK.